I had a great time painting snow in The Seirras last week. 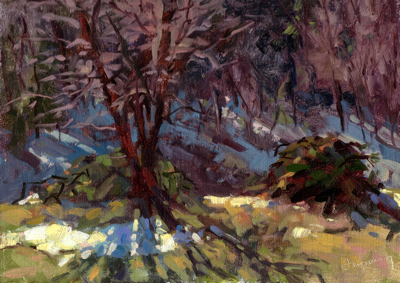 I love the shadows, and white in light and shadow are so fun to paint. Have you ever seen a John Singer Sargent painting with white bed sheets? The colors he finds there are amazing. This scene is behind the Miller’s place on Alta Lake. The caretaker has been clearing brush from around the house, and I found these two piles of clippings interesting. There was a patch of snow left there in the sun, and lots of snow in the shadow of the trees in the distance. This one was fun. I went for a drive and took lots of reference photos, and saw this interesting composition on the Truckee River. I put the camera away, and painted. 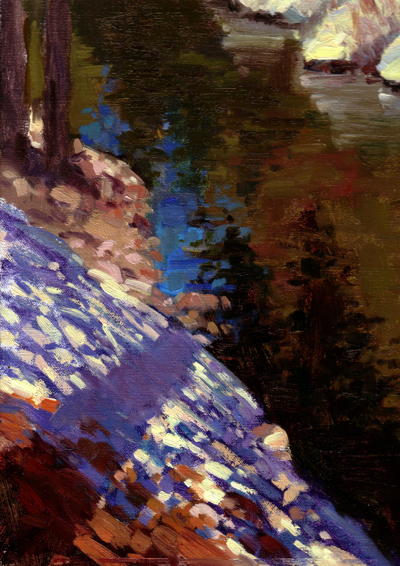 In fact, I think this spot was close to the location I painted “Snow Creek”, another piece that helped me develop my abstraction skills. I was really interested in how tree shadows from both sides the river met and intermingled. I wonder if this scene makes sense? Does it “read”?